My jazz class performed in a local talent show last Saturday. We danced to “I Love the Nightlife” by Alicia Bridges. 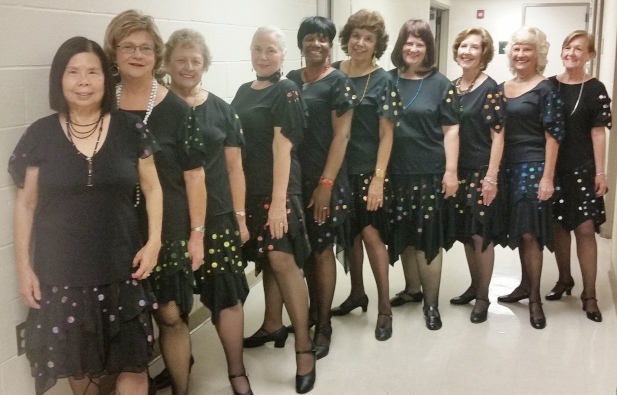 We sparkled, not just our smiles and spirits and steps, but our costumes too. The black outfits were decorated with prismatic smiley faces. Can’t get much more 70s than that! In case you don’t recognize me, I’m fourth from the right, so thrilled I got to boogie! You look adorable! You and all the rest! I recognized you right away and don’t you all look fabulous! Wish I could have seen that show. I love watching dancers. WTG Pat dear. You are all Rock Stars! Truly. Love this photo. Please, no matter what else takes place for your life. Don’t stop dancing. Y’all need to go visit Walmart in those clothes. Pat, you gals look terrific!!! So happy, lively and cool!!!!! Way to go!!! !